To really grasp Rudy Guilliani’s disdain and anger toward Islam, a bigotry he incorrectly assumes all non-Muslim Americans share, we need to closely study the keynote address he gave as an introduction to the Republican vice presidential candidate, Sarah Palin. By comparing the text handed out to the media in advance with the actual words used by Guilliani, we find that the former mayor of New York inserted a quip in his speech that insults Islam. Guilliani took his bias against Islam to a worldwide audience. He offered it as a key platform plank for Republicans with which to ask voters for four more years of the politics of fear. This is the same Guilliani who, as mayor of New York in October, 2001, rejected a check of $10 million for relief of the families of victims of 911. Why? Because the check came from a Saudi prince who, after giving the city the check, suggested that “the United States ‘must address some of the issues that led to such a criminal attack.'”. He specifically urged the US to take a more “balanced” approach toward the Palestinians. Guilliani took the word “balanced”, as an insult to Israel, and returned the check. Then and now, it was a stupid thing to do. In the weeks following 911, politicians like Guilliani did not provide leadership; they fanned the flames of anger and hatred that gripped a shocked nation. Seven years later, Guilliani still does not understand leadership. He still clings to the one thing he learned from 911: The politics of fear. It was that truncated wisdom he took with him to the Republican convention as its keynote speaker. When Rudy Guilliani used an insult quip, he exposed his biases. He hasn’t learned in all his years in politics that for a joke to be funny, you have to love your targets, not hate them. I cannot believe that the Republican speech monitors at the convention, those who prepared the tele prompters, would have approved the anti-Islam zinger Rudy sent out to his world audience. Rudy’s quip may have been field tested in a smoke filled back room of a New York City bar. Maybe it worked there, as it seemed to do for Republican delegates looking for red meat to chew on before they rush out to attack the elite media and make the nation embrace the small town values that will carry them to victory in November. Guilliani diverted from that text between 14:17 minutes and 15:53 into his speech (fast forward if you prefer) with added words highlighted in bold below. His new language reveals an anti-Islam bigotry which has thus far drawn absolutely no criticism from a media that normally watches candidates and speech makers like hungry wolves trailing a baby moose across an Alaskan tundra. Video of the speech: “John McCain will keep us on offense against terrorism at home and abroad. (extended applause) For 4 days in Denver, (omits “and for the past 18 months the) Democrats were afraid to use the words Islamic terrorism. I imagine they believe it is politically incorrect to say it. I think they believe it will insult someone, Please tell me who were they insulting if they say Islamic terrorism? They are insulting terrorists. (laughter and applause). Cause, of great concern to me during those same four days in Denver, they rarely mentioned the attacks of September 11, 2001. They are in a state of denial about the biggest threat that faces (omits “us now and in the future”) this country. These final sentences reveal Guillini’s faith in the “Clash of Civilizations” rationale which Republicans embraced to explain the events of September 11, 2001. It was the classic “us against them” approach to foreign policy and serves as a fear-engendering simplistic description of a complex international political situation. 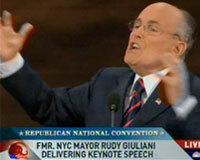 In his keynote speech to the Republican convention, Rudy Guillini damned Democrats by saying they are afraid, because of political correctness, to join him in denouncing one of the three major world religious faiths with a joke about “terrorism” that is grossly misleading and an insult to all Muslims. Somewhere, Henny Youngman is not laughing.